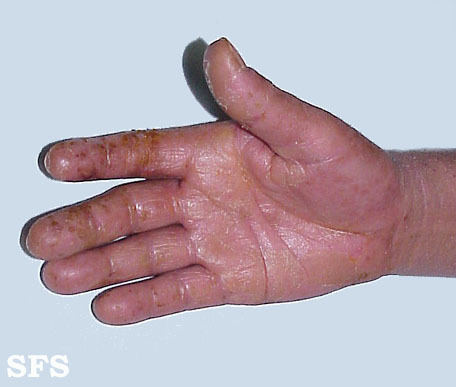 Contact dermatitis is one of the most common skin disorders usually associated with occupations where repeated hand washing is a requirement, like health care workers. However, it can affect any person of any age and is due to environmental factors ranging from substances such as soap, sweat and water to latex and certain metals. Contact dermatitis is an inflammatory skin condition that is caused by exposure to irritants or allergens in the environment. When these substances come into contact with the skin, it can either irritate the skin to the point that inflammation arises or it triggers an allergic reaction. Usually the inflammation is limited to the site of contact. The skin condition can affect any part of the body which comes into contact with a trigger. The hands are one of the commonly affected sites for obvious reasons. Contact dermatitis may be known by a number of different names depending on the trigger and location. This includes dishpan hands, latex allergy and hair dye allergies. Contact dermatitis can be easily prevented by avoiding the trigger and medical treatment may be necessary to ease the inflammation and control the symptoms until the condition resolves. In most cases there is no long term complications but sometimes there can be darkening of skin which may be permanent. Irritant contact dermatitis arises with contact to substances that irritate the skin. A person does not have an allergy to the substance. Instead to trigger substance is either toxic to the skin or even when non-toxic its ongoing presence may be potentially harmful to the skin’s integrity. Allergic contact dermatitis is where a substance elicits an allergic reaction in the skin at the site of contact. Here a person has a sensitivity to the particular substance. Allergic reactions are due to the immune system abnormally reacting to the presence of an otherwise harmless substance (allergen). Inflammation is the body’s response to tissue damage and is a protective mechanism. It elicits swelling, pain, redness and heat at the area. With skin inflammation, itching is another common symptom. Dermatitis simply means skin inflammation. Since this inflammation is triggered at the site by exposure to certain substances, this condition is known as contact dermatitis. It is not a contagious skin disorder although many people in the same household could develop it. Even in irritant contact dermatitis, individual sensitivity is a factor – some people may be able to withstand the trigger for longer than others without developing a rash. There are various other household irritants of contact dermatitis. With allergic contact dermatitis there may be no reaction at first exposure to any of these substances. Contact dermatitis is commonly found on the hands, neck, face, scalp, abdomen and feet. The affected area is usually clearly demarcated. Skin rash – redness, blisters, dry, peeling and cracked skin. Itching which is usually intense. A bacterial infection can arise at the area and other symptoms may therefore be present. This includes intense pain, pus, heat and a fever. Sometimes fungal infections may also arise. In severe and prolonged cases of dermatitis there can be long term complications like hyperpigmentation (darkening of the skin) even once the inflammation subsides. 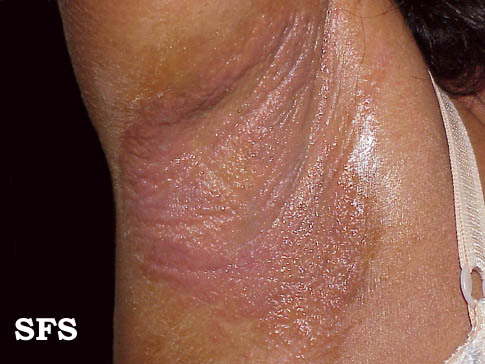 Lesions of irritant and allergic contact dermatitis appear largely the same. Pictures sourced from Dermatology Atlas Brazil. Antihistamines to ease itching and redness. Corticosteroids to suppress inflammation and immune activity. Immune modulators and immune suppressants apart from corticosteroids may be used for severe allergic contact dermatitis. Petroleum jelly and other barrier applications can help the skin to retain moisture while reducing the contact between the skin and trigger. Wash the area with cool running water. Not only does it soothe the inflammation but it can also wash away the irritant or allergen from the skin surface and minimize the chance of the dermatitis arising or worsening. Use mild soaps that are free of strong fragrances. Soaps are a common irritant in contact dermatitis, however, it is very effective in removing surface dirt. Therefore soap can be helpful in removing irritants and allergens from the skin surface. Protective gear like rubber gloves and plastic face masks can help to reduce exposure to triggers, like household detergents and industrial chemicals. Remove triggers from your living area such as plants or minimize entry to pets if this is the problem. Try to change detergents or cosmetics to different brands or types. Avoid using metals or chemicals that trigger dermatitis.